Want to secure your house with some IP cameras? Then you may be interested in TRENDnet's TV-IP322P, these new megapixel cameras promise night vision in complete darkness for distances of up to 20 meters. TRENDnet, a best-in-class wired and wireless networking hardware brand, today announces the availability of the SecurView Outdoor PoE Megapixel Day/Night Internet Camera, model TV-IP322P, which provides powerful Megapixel night vision in complete darkness for distances of up to 20 meters (66 feet). This camera is outdoor ready with an IP66 rated weather proof and vandal resistant enclosure. A wall/ceiling mounting bracket is included and a sun visor shields the camera from direct sunlight. No need to install this camera near an electrical outlet. Power and data are received through a single Ethernet cable using Power over Ethernet (PoE) technology-making it easy to install this camera in remote locations. Record crisp HD video with 1280 x 1024 pixel resolution and advanced H.264 image compression. Manage up to 32 TRENDnet cameras with the included complimentary SecurView camera management software. Advanced features include motion detection recording, email alerts, scheduled recording sessions, H.264/MPEG-4 image compression, 3GPP support, Samba client support, Input/Output ports to network to an alarm system, date-and-time text overlays, mask overlays to conceal sensitive areas, and digital zoom. TRENDnet's SecurView Mobile application allows users to view real time streaming video from SecurView Internet cameras on mobile devices. SecurView Mobile is free and works with network enabled Android, iPhone, iPod, or iPad devices. Simply search 'SecurView Mobile' on the respective application store. 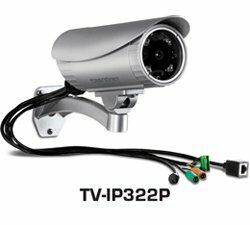 The SecurView Outdoor PoE Megapixel Day/Night Internet Camera, model TV-IP322P, comes with a three year limited warranty and is currently shipping to all online and retail partners. The MSRP for the TV-IP322P is U.S. $599.99.